The MS45xx series is a small, ceramic based, PCB mounted pressure transducer using Measurement Specialties’ proprietary UltraStable™ technology (MS4525/MS4525DO) and the latest CMOS sensor conditioning circuitry. 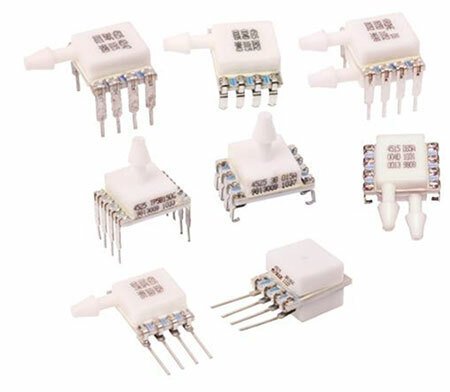 This series contains both analog output (MS4515/MS4525) and digital output (MS4515DO/MS4525DO) where the digital output versions feature either I²C or SPI interface and provide 14-bit pressure as well as 11-bit temperature sensing. a total error band (TEB) of less than 1.0% over the compensated range. The sensor operates from a single supply of either 3.3 or 5.0Vdc and requires a single external component for proper operation. The rugged ceramic transducer is available in side port, top port, and manifold mount and can measure pressure up to 30inH2O (MS4515/MS4515DO) and 150psi (MS4525/MS4525DO). The 1/8” barbed pressure ports mate securely with 3/32” ID tubing.